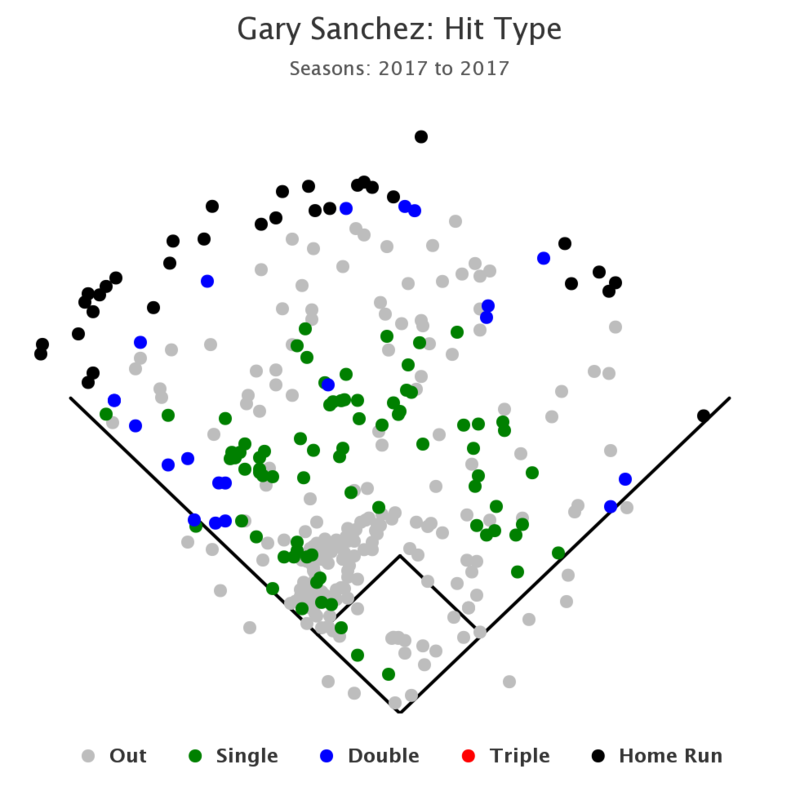 Gary Sanchez has been off to a slow start for the New York Yankees and after a year in which he hit .278 with 33-HR and 20-2B. After beginning the season with a 2-36 mark, he has had some consistent contributions make their way onto the score card. An excerpt from a recent Fangraphs article suggests that his pitch selection and zone recognition seem to be relatively consistent to his 2017 season as well as his K-rate down from a year ago. While it is early, the recent trend of performance is nothing to "write home" about. 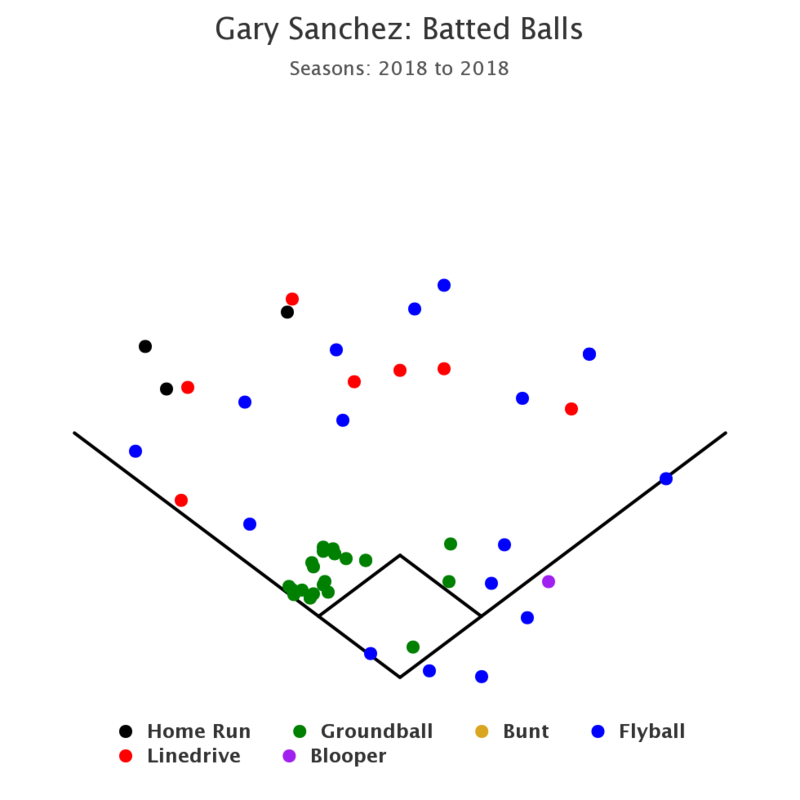 Aside from the freezing temperatures in the Bronx, Sanchez remains a target of the three headed monster that is Judge, Stanton and Sanchez (We could throw Didi in their given his terrific start in 2018). From a mental perspective, anytime there is an offensive addition (and Stanton is no ordinary addition) there is a tendency to "keep up" with the production. Hitting behind two of the most dangerous hitters in baseball lends itself to a more competitive at-bat as there is now an element to protection. That and the combination of a mediocre start for the Yankees could be some of the non-statistical factors at play. However, what we do note is his spray charts to date is the heavy pull-side production, especially on the ground. There has been an abundance of ground balls to the left side and that in combination with a higher fly-ball out rate has led to a decreased batting average on balls in play. Again, while this information comparatively to 2017 is premature at best it is important to acknowledge the relationship between his results and "what he is swinging at". With a majority of the pitches that he is seeing located in the low/outside quadrant of the plate, he has been swinging at a higher percentage of pitches located in the bottom/inside quadrant of the plate. Now, why does this matter? It matters as his Contact% on pitches located in that low/outside quadrant of the plate is significantly lower to that of pitches located on the inside half of the plate. To say that he has been "pull side" heavy seems to be an accurate assessment of the approach thus far. For a guy that showed a lot of power to left/left-center field in 2017, there may be an attempt to look for elevation to the pull-side. That and his recognition of off-speed may be compromised as he is putting pitches in play weakly. An "over-commitment" to change-ups considering the arm-side run from RHP's and/or the back-foot slider from LHP's tend to be the go-to out pitches that factor in situations like this. Hitters are looking to a more "pull-side" approach and are selling out to the fastball inside thus limiting their adjustability on balls that cut and run. Mechanically, I really like the actions. We see a ton of depth being created with the rear forearm whipping the barrel of the bat around the hands. From a directional standpoint, we can see the lead elbow remain in place as the lead hip begins to open as a result of the back hip firing. This leads to a greater deal of separation and tension between the shoulders and the hips allowing for ample time to see the baseball. An area of consideration here would be the timing element. I am all about athletic movement and "flow". Flow to me is a combination of rhythm and timing. However as we can see with his late barrel tip as the lead knee begins to make it's way forward and towards the ground, if this move is made too late, there is going to be a great deal of compensation with the upper half. Something as simple as that barrel loading a tick too late could cause the entire swing sequence to breakdown. My advice to hitters experiencing connection issues is to exaggerate balance and control at the gather and really feel a connection at the center of your body early. 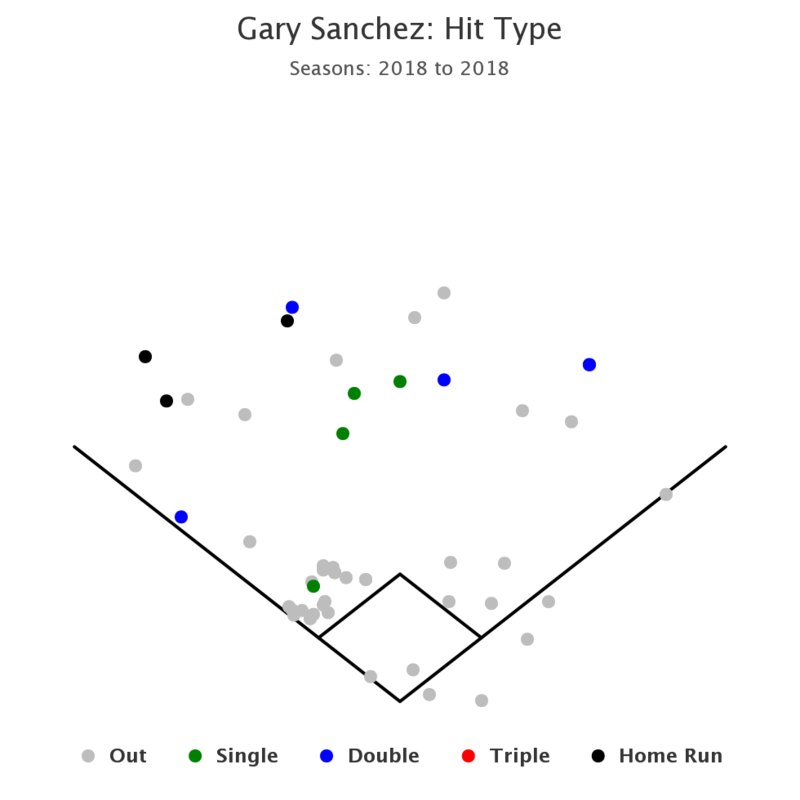 This being a small sample size does not paint a picture for the career Gary Sanchez has had thus far. His mechanics and obvious strike zone discipline are areas that should carry him through these momentary blips on the radar. The AP Academy is a baseball development company. Are you looking to find out more information about APA and our training programs? Please fill out the form below and/or contact Athlete Support. A member of our team will connect with you to discuss our training programs. Please elaborate on any training requests or inquiries that we can help you with. Thank you for filling out our Sports Performance inquiry form. A member of our team will reviewing your submission and will be getting back to you within 24-hours.